Now that 2015 is here there is one main focus of mine. I do not want to fall victim of sloth. One of the seven deadly sins. Life is way too short to sit around and be lazy all day. Instead, I want to go out and adventure more. Last year was a great year for me. I tried new exciting things, pushed myself to do more, and found that I was just happier all together. I want to continue that trend this year! I've lived in Michigan for fifteen years now and I have never been to the Upper Peninsula nor Traverse City, Mackinaw Island, Pictured Rocks, or even Silver Lake Sand Dunes. This mitten of a state has so much beautiful nature to offer and I've barely seen any of it. 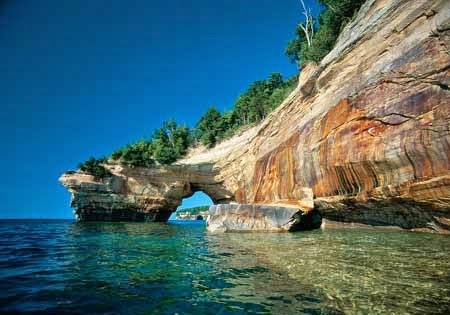 My objective this summer is to venture around Michigan some more. Picture Rocks being first on my list. I have heard too many rave reviews about this location to simply pass it up. I would want to camp onsite and then take a kayak tour on Lake Superior to get an even more exquisite view of this marvel. Also, I've only been to Lake Erie. Eventually, I would love to check off all five lakes that surround Michigan. A cruise would be nice also. I've been on one to the Bahamas it is relaxation heaven! You pay once and then everything else is all-inclusive. You can't beat it! Sailing on the endless blue ocean under clear and beautiful skies is breath-taking. Even the thought of a nice tan is calling my name during this cold winter. But to take matters even further around the world I desperately want to travel to Spain. I have been wanting to go there for years. YEARS! Whether or not I go this year, we'll have to see, but one day I'll be there. I have studied Spanish for basically my whole life and there is nothing more that I want than to fully submerge myself in the language and culture. The architecture is exquisite, the food looks delicious and the style of dancing is phenomenal. Yo quiero visitar Barcelona primero! Barcelona has always been first on my list of cities to visit while in Spain but I may even run with the bulls in Pamplona...okay maybe not run with them, I'll watch. BUT you can definitely count me in for La Tomatina Festival in Bunol. Who wouldn't want to join in on a ginormous tomato food fight?! I don't know if I'll be able to accomplish all of these places in one year. If I do, that's awesome. If I don't, there's always next year. Mainly, I just want to "do" more things this year. Even if it's going to concerts, sports events, or just playing basketball outside with the neighbors, I'll be happy. Sloth won't do me any good so I refuse to let it get to me! Haha! That would be awful! I hope that never happens if you ever end up going.